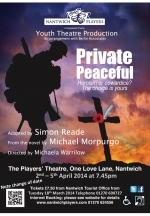 PRIVATE PEACEFUL adapted from the Michael Morpurgo novel by Simon Reade. Private Peaceful is set in the fields of Devon and the WW1 battlefields of Flanders, giving us a heart-breaking glimpse of the way we once lived - and still die. The play is a classic 'rites of passage' story of two brothers and the exuberance and pain of their teenage love for the same girl, the pressures of their feudal family life, the horrors and folly of war and the ultimate price of courage and cowardice. Full of rich, rounded characters, Simon Reade's adaptation from the novel of Michael Morpurgo takes the audience on a mission to "set the record straight" with regard to the conviction for cowardice. Directed by Michaela Warrilow, performances will be at 7.45pm, 2-5 April 2014. Tickets on sale Tuesday 18th March, 2014 at Nantwich Civic Hall (01270 600727). Heroism or cowardice? The choice is yours.